Let's begin a conversation on how best to stop bullying of elderly and disabled persons in multifamily housing. There are four elements needed to stop bullying and create a healthy community. Together, they help to create a polity, a form of governance with accepted norms and rules that are enforced, and with a means to resolve disputes. Everyone shares responsibility and no person—housing provider/landlord, manager, staff, resident, visitor either bullies or is bullied. Housing provider and all agents (including providers of social work services) take responsibility, are trained to recognise and deal with bullying and with developing healthy community, and are certified to be competent in these areas. Trained professionals provide necessary social, psychological, and medical support for all residents. They help resolve conflict and support the growth of a positive community. All residents can participate in a democratic, representative tenants’ association through which they negotiate and collaborate with the housing provider. Empowered residents receive education, training, and guidance and there is oversight, enabling them to develop community life. Social, educational, and cultural activities organized by residents or staff help to create a healthy community. External oversight provides readily available, effective, and fair legal protections for victims, along with respect for the rights of the accused. There is an ombudsperson. A residential setting is also influenced by the relationship to the surrounding community and the dominant values in that community; and by the actions of local and state elected legislators and officials. 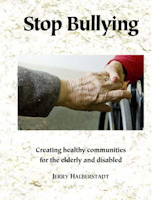 Source: Jerry Halberstadt, Stop Bullying: Creating Healthy Communities for the Elderly and Disabled, (Peabody:Togethering Press), 2017. Copyright Jerry Halberstadt 2017.